Two Piedmont Technical College students were recently awarded the Honeycutt Scholarship. 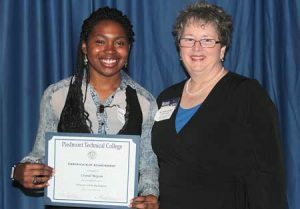 Pictured are, from left, Crystal Mayson, a criminal justice student from Edgefield, and Brenda Brooks, scholarship committee member. Not pictured is Jimmie Carroll, a criminal justice student from Trenton. The scholarship is awarded annually to Edgefield County students and is based on academic achievement and financial need.